Two weeks ago, as the New York Times published a feature about how the new (and stadium-seeking) owners of the Milwaukee Bucks were “a case study in all that is wrong with our arena-shakedown age,” the folks behind Calgary Sports and Entertainment Corporation were putting the finishing touches on a grand new stadium proposal of their own. On August 18, CSEC CEO and Calgary Flames president Ken King and his associates announced their vision for a project dubbed CalgaryNEXT, a multibuilding, multiuse facility that would replace Calgary’s current aging athletic infrastructure and serve as a home to four local hockey, football, and lacrosse franchises. The announcement was fortuitously timed: This spring the Calgary Flames, buoyed by a corps of young, dynamic players (and a lot of luck), fought their way into the Stanley Cup playoffs and upset the Vancouver Canucks in the first round. The Calgary Stampeders of the Canadian Football League entered this season as the reigning Grey Cup champions. With excitement about last season breeding anticipation for this coming one, it was an opportune moment for CSEC to lay out its plans. In this rancher city of just over a million people, a place known for its annual Stampede rodeo and its NHL arena called the Saddledome, CalgaryNEXT has the makings of a wild horse that won’t be tamed. That’s how these new arena imaginings typically tend to go, anyway, and this one seems no different so far. Pretty architectural renderings that likely bear little similarity to what might actually take shape? Check. A small upfront private investment that is but a drop in the multiple buckets of suggested public funding? Check. A name with precious syntax? Check. (Edmonton, another Albertan city to Calgary’s north, currently leads the pack on this front, having recently released marketing materials banning the use of the word “the” in conjunction with its planned Ice District.) Ecological snafus and the word “retractable” and overly optimistic salesmen and a predictable paucity of parking? Check, check, check, and check. The Times article on the Bucks noted that the recent moves made by the team’s owners “were right out of the professional sports owner handbook.” Little did they know that there kind of is such a document. In 1998, Neil deMause and Joanna Cagan published the book Field of Schemes: How the Great Stadium Swindle Turns Public Money Into Private Profit, a compendium of the never-ending arms races between sports owners and municipal politicians, between pro leagues and their fans. DeMause and Cagan had plenty of material, from the Colts’ move from Baltimore to Indianapolis in 1984 to the impending demise of Tiger Stadium in 1999. But so much more has gone down since their book was published in the late ’90s — the relocation of the Montreal Expos to Washington, D.C., the spate of new stadiums in the New York metropolitan area, the battle over Fenway Park, and on and on — that in 2008 the authors released a revised and expanded edition that covered many of the ventures fueled by new “innovations” in municipal finance. But both versions of Field of Schemes feature an early chapter called “The Art of the Steal,” which outlines the six steps that most owners and developers seem to follow when they agitate for the athletic ideals of faster, higher, stronger to be poured in concrete form. How has CalgaryNEXT done, at this early stage, in sticking to this playbook? Let’s take a look. Derek Leung/Getty Images The exterior of Scotiabank Saddledome. Last year, Flames president of hockey operations Brian Burke referred to the arena, with his characteristic bluntness, as “embarrassing … the finest state-of-the-art 1988 building in the league.” During last season, Gary Bettman paid a visit to Calgary and remarked that “I think everyone knows the issue with respect to the facility … this is a building that needs to be replaced.” In hindsight, it was only a matter of time before something like CalgaryNEXT was announced. It’s not unusual for the game to start out this way, though; Field of Schemes points out that it’s a delicate dance, that “those who are too direct about the threat risk getting slapped down by angry local politicians and columnists.” Still, things have a way of deteriorating. Take the Edmonton Oilers, who are years ahead of Calgary in the new-arena life cycle. (The path taken by Oilers ownership in its quest to get Rogers Place approved was described in a 2012 article as “four years of fuzzy numbers, shifting statements, apologies, bluster, brinkmanship, and revisionist history” — par for the course in these matters.) It was only a few years back that the Oilers brass and Wayne Gretzky just happened to be spotted in a luxury box at a Seattle Seahawks game. Now, the skeleton of their new building has risen in downtown Edmonton — sorry, in Ice District — and is expected to open next year. For Calgary, it’s still too early to be pushing these sorts of threats; nothing has descended that far into chaos and seeing-other-people subterfuge. Yet. It’s cringe-worthy to contemplate how quickly a once-upscale building becomes an also-ran, but the Saddledome is the fourth-oldest building in the NHL. The three older are Madison Square Garden, which just underwent a billion dollars’ worth of refurbishing; Detroit’s Joe Louis Arena, which is not long for this world; and Edmonton’s Rexall Place. With Edmonton having already committed to its outsize new project, Calgary faces the implicit rivalry of keeping up with its biggest local rival, not to mention the NHL’s other teams. But these insecurities aren’t just on the ice. Often, this step of the process plays not only on a fan’s fears that his or her team might be left behind while others modernize and uplevel and lure free agents. It preys upon an entire city’s sense of self. The people behind CalgaryNEXT have repeatedly stressed that this wouldn’t just be a new sports arena: It would be a community center, one that could revitalize an entire blighted neighborhood (more on that shortly) and include, among other things, a multiuse, semipublic field house that the city has sought to build for years. This field house is important: It’s the stated link to public funding for the entire project, a sort of sly “well, if you’re already going to the store, would you mind picking up a lifetime of groceries for me?” infiltration. Still, the existing numbers are as follows: The team says it will put up $200 million of private money. OK. Another $250 million would be reimbursed with a cut of future ticket sales, although it’s unclear exactly who would be up-fronting all of this dough. Two hundred million dollars would be straight public funding, and the CalgaryNEXT developers take great pains to stress that this amount is already earmarked by the city for that field house, which would be built regardless. But Mayor Naheed Nenshi has said that city funds have been allocated through 2018, and this project is not currently in the works. And then there is $240 million worth of a “community revitalization levy” — essentially a speculative source of funding in which debt is repaid by future taxes on local developments in the planned arena district that are, as yet, nothing but a gleam in entrepreneurs’ eyes. That sure is a lot of public funding for a project whose future revenues will, you can assume, almost entirely accumulate to the private side. The bad news: According to King, when it comes to CalgaryNEXT there is no Plan B. This is how it starts. A retractable roof may not be in the current plans for CalgaryNEXT, but the project does feature retractable seats. And that’s not all: According to the development’s FAQ, “We are exploring an option for a translucent roof for the Fieldhouse Stadium.” Cha-ching! But these sorts of potential fancy overruns don’t compare to the two biggest omissions in the CalgaryNEXT plans. One is any logistical consideration about the cost of roads and access to the new buildings. The other is the fact that the proposed site of development — an area called the West Village, which currently houses a Greyhound terminal and a bunch of car dealerships — is the site of major creosote contamination. A now-defunct plant that decades ago treated railway ties and telephone poles has left the land borderline unusable; any significant development in the area would first require a massive environmental cleanup. Estimates of the cost of that job have climbed as high as $300 million and isn’t included anywhere in the math about how much CalgaryNEXT would cost. The developers argue that cleanup would have to take place regardless, and that it therefore isn’t part of their project costs, per se. But no one is forcing them to develop on this particular parcel of barren land, and this is all pretty much the definition of keeping the goalposts out of reach. Speaking of moving the goalposts, there are those who believe that all of this is just the first step in what ultimately could become a bid for the 2026 Winter Olympics; that what we’re seeing is just the pump being primed. It makes sense: The original Saddledome, after all, was built that way. 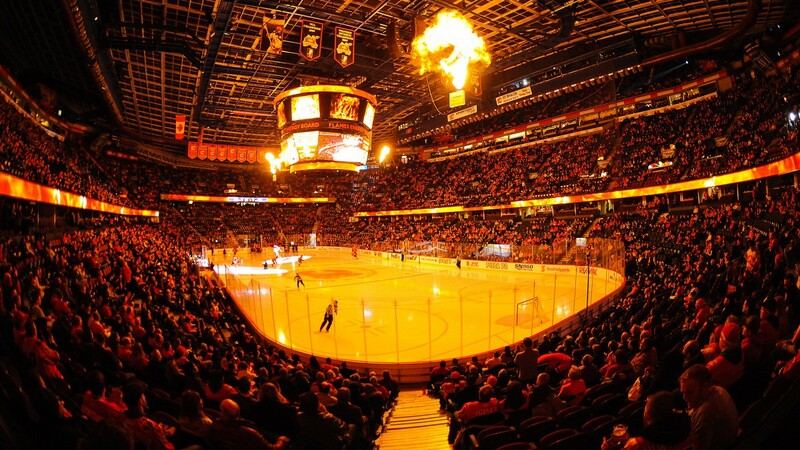 Never mind that, in 2011, sports economist Andrew Zimbalist remarked that “the signature venue in Calgary, the Saddledome, [was] viewed as obsolete and in need of replacing less than twenty years after the end of the Games.” Could CalgaryNEXT be … next? Derek Leung/Getty Images View of the interior of Scotiabank Saddledome before a game between the Calgary Flames and the Columbus Blue Jackets. Nothing should, but that doesn’t mean it isn’t still startling. Like any city, Calgary is a place where budgetary constraints are constantly reshaping priorities and causing tough decisions; over the last decade, a cancer center, for example, has been proposed and delayed and downsized and passed around. Summer floods and winter snow removal must constantly be managed. Alberta, as a province, is always subject to the ultra-boom-bust cycle of the oil industry. There are so many places in need of municipal funding. Should a new arena be among them, particularly when the taxpayers don’t directly share in the upside that they are asked to support? This is not a Calgary-specific question; it’s one that plays out, year after year, all around North America, and more often than not the team owners and their chosen developers follow the well-worn steps to get their way. A few years back, in a Sloan Sports Analytics conference on negotiation, the Flames’ Brian Burke (then with the Maple Leafs) explained that “my theory is, make the first meeting as short and unpleasant as possible. Sometimes it’s better to just punch the guy in the face.” But in the case of CalgaryNEXT, you get the sense that there is more unpleasantness yet to come. Once the balls get rolling, everything has a tendency to go downhill. This post has been updated to correct the year Field of Schemes was originally published.